Meet one of my favorite restaurant at Shangri-La Hotel Jakarta. If Satoo is the place to go whenever gluttony has more control over you and Shang Palace is the place to go for premium Cantonese delicacies, then Rosso is the place to go if you’re looking for one of the best authentic Italian dining in Jakarta. And you'll know why in a moment. Rosso’s décor is mostly dominant with elegant red with several types of seating to accommodate different guests. There’s this big, bold sofa seats at the center of the room with comfortable cushions; both rounded and long tables near the window that gives bright lighting which is perfect for brunch & afternoon chit-chats; and also there’s the bar & lounge section in front. Behind every famous restaurants stands a great line of professional cooks, and at Rosso we all have to thank Chef Oriana Tirabassi, a passionate Italian-born with world-class experience and amazing skills. She was the first woman to achieve the title on Acrobatic Pizza Spinning in Pizza World Championship in Las Vegas in 1994, and remains the only lady chef holding the honour to this day. And that alone is a strong reason on why I feel really honoured to meet her & taste her fine-art cooking last week. A chef of many passions, indeed. 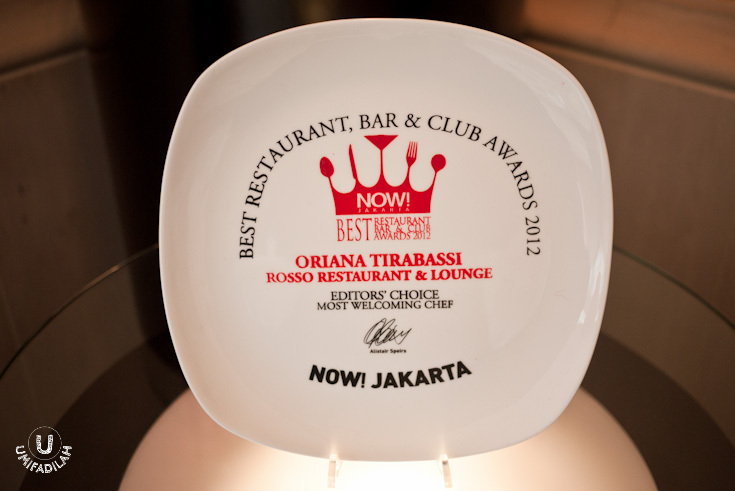 Voted as the Most Welcoming Chef in the Best Restaurant, Bar & Club Awards 2012 by NOW! JAKARTA. There’s an antipasti buffet at the corner of Rosso where you can choose over dozens of Italian starters such as fresh salad station (keep an eye on those bouncy buffalo mozzarella! ), cold appetizers, frito misto, smoked salmon & imported hams, and also cheeses & fruits. Overwhelming choices of high quality ingredients are ready to spoil your palate with delectable treats. 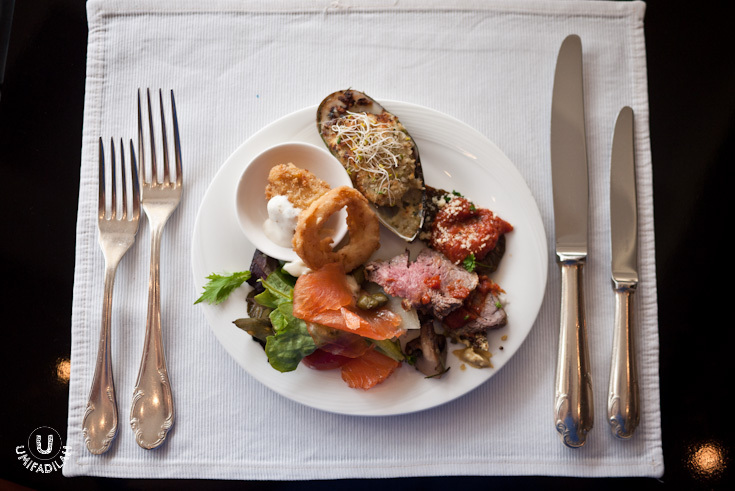 My plate: smoked salmon & capers salad, beef crudo, aubergine, frito misto, and baked clam. Special appetizer by Chef Oriana: Burrata cheese salad. Burrata comes as a family of mozzarella with a distinct texture inside and out – outside like a typical bouncy buffalo mozzarella, but the insides are as creamy as mascarpone. Combined with fresh diced tomato & salad on the side, seasoned with light salt & pepper, this leaves a refreshing after-taste. Really nice! C – Mattusc Misto Capra. D – Valtellina Casera Dop. E – Parmigiano Reggano 36 month. 1 – Sainte Maure De Touraine Formage de Chévre au Laite Cru. 2 – Camembert Affine au Caluados. 3 – Fermier au Lait Cru Le Granol Bornand Reblochon. 4 – Le Bon Normand Pont Leveque. 5 – Livarot de la Perelle Calvados. I honestly am never the type of cheese connoisseur before, but by tasting each of the distinct flavors above I surely learned a lot that day. I learned how Italians prefer their cheese to be more subtle in terms of taste, but most have typical rock-solid texture that’s usually being cut from a huge cheese block that has been aged for long periods, such as Parmigiano, Parmesan, etc. While French people loves their cheeses to be smooth & silky in texture (with lots of butter usage in the making, which also explains the short life-span), but the antique tantalizing cheese smell is also very, very strongly tainted – take sample #1 and #2 from the picture above. Gosh, Camembert is one heck of a smelly, smelly cheese! Chef Oriana also said that Jakartans people prefer ‘sweeter’ & subtle cheese flavor such as Fontina, etc, and most of us here can’t stand the strong foul smell. Well I say, most of us only recognize Cheddar/Mozzarella because of the easy- access on the supermarket; and that’s exactly what they’re putting on their fast food meal, LOL. Assorted grapes and dried fruit: Figs, Californian Plum and Apricot. Honey and homemade compotes: apricot, orange, and strawberry. 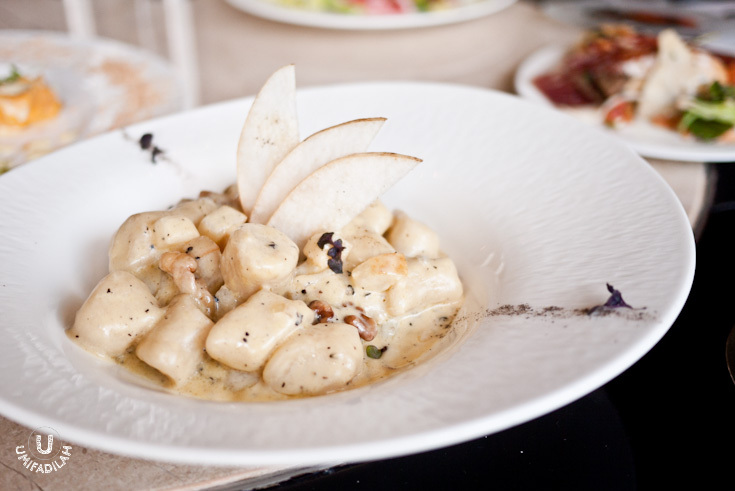 Gnocchi with gorgonzola, pear, walnuts, black pepper and creamy sauce – IDR 80.000. Creamy gnocchi dish has always been my favorite when it comes to pasta, and Gorgonzola is just the right type of cheese for that. The addition of pear & walnuts add more crunch & the strong black pepper gives flavor balance to the dish. My only tiny feedback is for the gnocchi cubes to shrink down to a smaller bite-size – aside from that, this hearty dish wins my heart. Cheese fondue with selection of steamed vegetables and cheese bread – IDR 60k. This might be the 'weakest' dish among other main courses on the menu, but I did enjoy munching on my vegetables especially by dipping both asparagus & carrot to the fondue. The bread? Not working so much for me. Beef tenderloin with fontina cheese, capers and potato – IDR 410k. A thick cut of superbly seasoned fillet-mignon covered with Fontina cheese... Wow, a sensational love-at-my-first-bite that might just become one of the reason I’m glad I’m not a vegetarian. I wish I had the whole steak for myself, you know. And the mashed potato that absorbs the sauce underneath was a really good accompaniment to the dish. Just can’t stress enough how much I love the dish! Thanks Chef Oriana! Thank you! Semifreddo al Torroncino (Nougat Semifreddo Ice Cream with Hazelnuts) – IDR 62.5k. We were intrigued to order Cannoli siciliani dessert from the Cheese Promotion menu but unfortunately they weren’t ready for another hour so we ordered their signature Semifreddo instead. Cut half so you can see what’s inside. The nougat ice cream was really smooth and not overly sweet, plus you can taste the earthy hazelnut together with the sauce. Good thing that the ice cream didn’t melt so quickly, it just sat there gracefully while we took our time taking photos and adoring its refine presentation at the same moment. Funny how I ate so many kinds of cheeses that day but didn’t feel much bloated. I guess with great recipes (and skilled chefs!) and the right eating technique I find myself enjoying all of them. If you’re looking for an ultimate Italian journey, mark my words: Trust your meal to Chef Oriana at Rosso. She knows what she’s doing and I’ve been more than honored to sample her tasteful treats. [Wednesday ONLY) Buy 3 Get 4 for Buffet menu @ShangriLaJKT (SATOO Restaurant, Shang Palace Restaurant, ROSSO, & Lobby Lounge) till 1 Feb'14. Smoking Policy: Smoking is not permitted in Rosso.